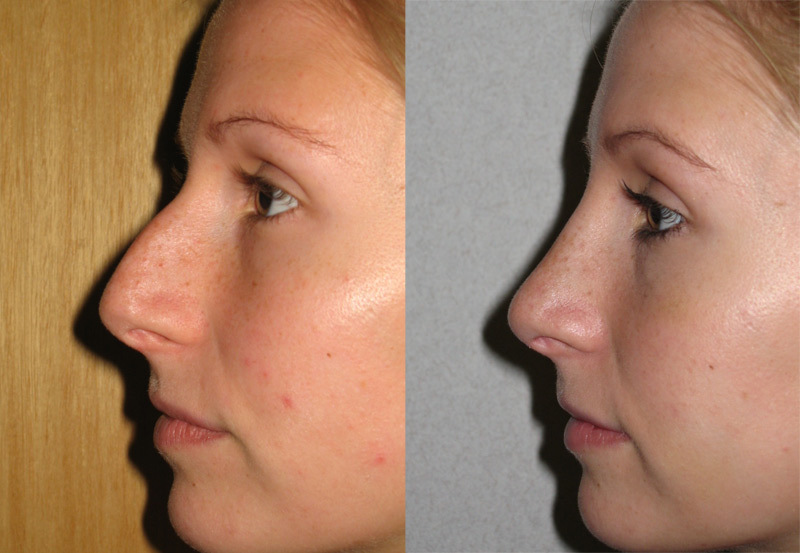 Why Choose To Have Rhinoplasty? Whether you feel that your nose is the too long, too big or has a ‘hump’ on top, this procedure can make a big difference to your overall appearance and self esteem. The operation will depend on the area being treated, but will involve re-shaping of the cartilage and bones of the nasal bridge (dorsum) and /or the cartilages of the tip. When most of the work is being done to the bridge for removal of the hump the surgery is usually performed from inside the nostrils (known as Closed Rhinoplasty). When the tip cartilages are being changed then an Open Rhinoplasty is performed involving a cut made on the columella (skin between the nostrils). Cartilage and bone will be removed from bridge of the nose, which is then fractured to allow the remaining bone to be moved closer together. This results in both removal of the hump and narrowing of the nose. When the tip of the nose is to be treated the cartilage that supports it will need to be partly removed or reshaped. This will sometimes be done through the nostril (Closed Rhinoplasty) or through a small cut in the Columella (Open Rhinoplasty). I am delighted with the results and feel more confident with my appearance. Both Closed and Open Rhinoplasty will result in very little/no visible scarring. Closed Rhinoplasty is carried out inside the nostril and the scars inside the nose almost vanish after a period of time. 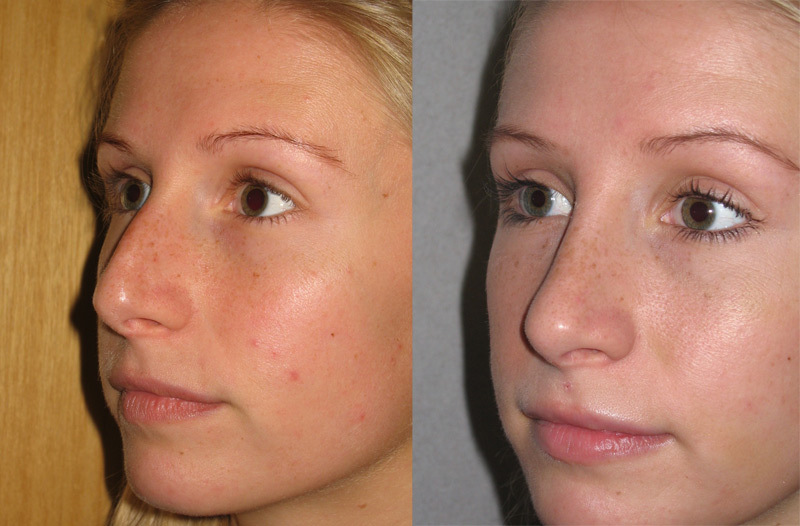 For patients who have Open Rhinoplasty the Columella incision heals very well and also becomes very difficult to see. If you are a smoker, try and stop for a minimum of five days before and after surgery as it can reduce the chances of complications. The operation takes approximately 1.30 - 2.50 depending upon the technique. A splint will be placed on the nose and held in place with tape. A pad will be placed underneath the nose. This will be removed after 12 hours, but the splint will stay on for 7 days. People vary in recovery, but patients should allow 2 weeks to recover. Most patients are comfortable after 3-5 days, but will be bruised and find it difficult to breathe through the nose for up to 2 weeks. Patients usually feel able to walk a distance at 3-5 days, swim by 3 weeks (if fully healed). Strenuous exercise (aerobics etc) should be avoided for 4-6 weeks. Day 1 You should be taking it very easy! Either relax in the hospital or at home. Day 2-7 You can be up and about but you will still feel discomfort and will need to be protective of your nose and splint. 7-14 Your stitches will be removed and most of the swelling and bruising will settle over this time. You will be feeling much better from here onwards. You can start exercising gently and build it up over the next 10 days. Week 3 onwards you will be nearly back to normal. Day 7-14 You will be feeling much better, starting to return to your normal routine with gentle activity. Although your dressing and splint will be removed after 7 days, you will need to be protective of your nose for a further 1-2 weeks. Some patients can get back to most gentle activity. Dressing will be off after 7 days. Week 2-6 You should be back to work and doing anything you wish by 6 weeks. Patients should avoid driving until they are completely free of pain and restriction, and be able to confidently perform an emergency stop. This is to ensure they will be covered by their insurance policy. It may take up to two or three weeks to recover sufficiently. We will check your wound and change the dressing at day 7. You will then have an appointment with Stephen McCulley at 10-14 days, and then again at 3 months. You will not be charged for any follow up appointment relating to your surgery. It is common to experience some bruising and this will take 2-4 weeks to disappear. The final result will improve over the first 12 months. Bleeding: Minor bleeding is common and stops in the first 24 hours. In a small number of cases the bleeding can be heavy and can result in having to return to theatre to control it. Scars: Both Closed and Open Rhinoplasty will result in very little/no visible scarring. See 'Scars' at the top of the page for further information. Infection: Very uncommon but if occurs you may need a course of antibiotics. Skin irregularity: Although uncommon, if the bridge of the nose is treated to remove a 'hump' the bone and cartilage left behind can have small irregularities that may show through the skin. Change in skin colour: Skin on the nose can become pink, but this tends to only affect patients who undergo repeat Rhinoplasty procedures. Asymmetry: There can be subtle differences between the two sides of the nose from differing bone or cartilage position. Pain: A small number of patients experience some pain for a number of weeks after the surgery. Loss of smell and taste: This is usually transient, but for some patients their senses can be altered long-term. Swelling: Usually patients experience little swelling in the nose. The exception can be in Open Rhinoplasty, in which the nose may be more swollen and take longer to settle. What does Nose Re-Shaping (Rhinoplasty) cost? If you'd like to see more then please view our frequently asked questions on Cosmetic Face Procedures!